A funeral notice, in other words, is a notification that informs others about the passing away of a specific person and requests their presence at the said person’s funeral. The funeral notice is supposed to be a formal document – one that is sombre and solemn in nature. If you haven’t created such a notice before, you can always check out these amazing funeral program templates here. The templates have been created specifically for the occasion. 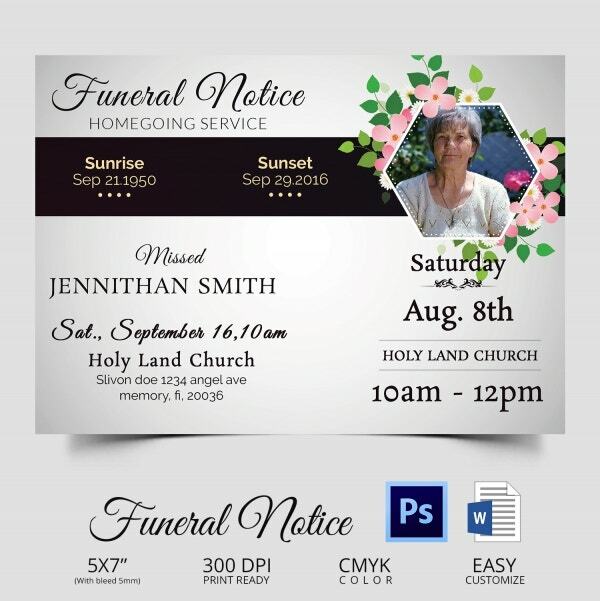 This funeral notice template comes with a simple black and white image. The monochrome image certainly adds a different tone to the template. Also, each element is subject to customization. 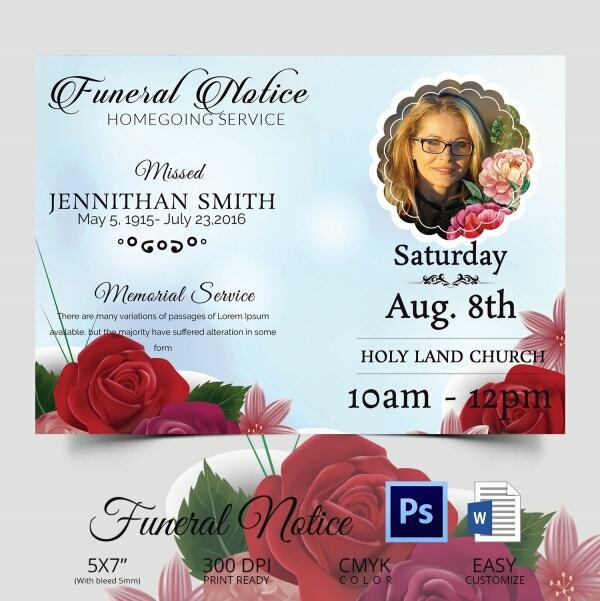 This funeral notice template comes with beautiful designs strewn all over the templates. Also, it allows you to customize the various elements like the images. You get retina ready coloured images here. The beautiful light blue background certainly makes the template stand out. 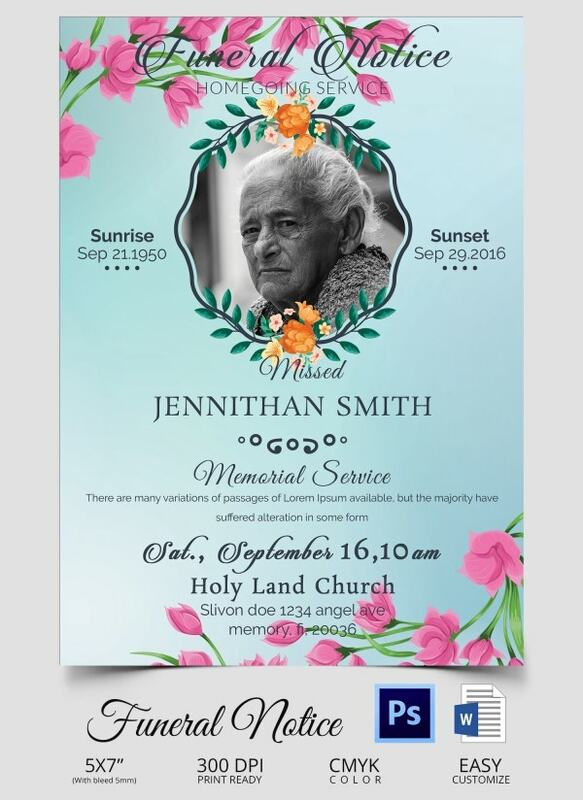 Also, this funeral notice template allows you to add or remove elements as per your requirements. You can edit it as you please. 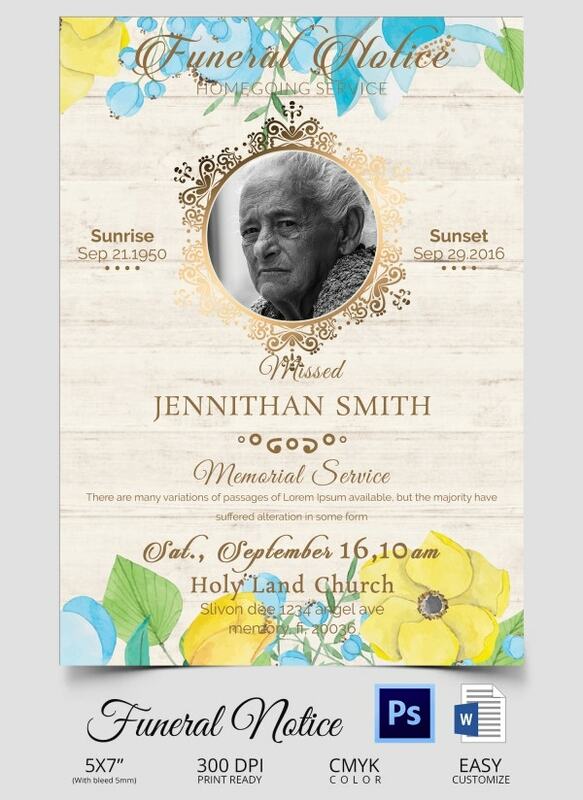 This funeral notice template provides you with ample space to include all the details that you feel are necessary. In fact, the format has already been provided to you. You just have to follow it. This certificate comes with word and psd compatibility, easy customization of color and text, standard size with allowance for bleed, a CMYK color mode, fairly high resolution of 300 dpi and a print ready format. > What does a Funeral Notice Look Like? A funeral notice isn’t exactly a funeral invitation; it actually is more detailed and specific. For instance, it will contain certain details about the deceased and would also contain an obituary. 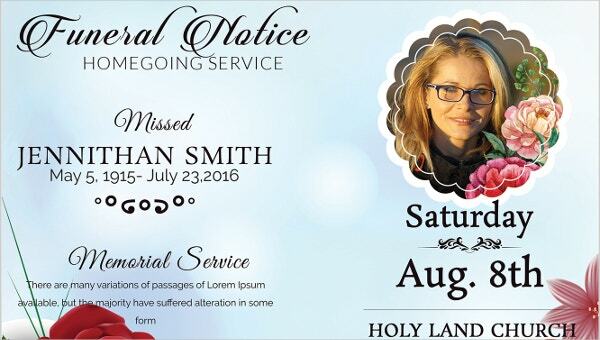 Some funeral notices even contain a eulogy on the back side of the document. It also comes with a solemn or sombre design which adds a different aura to the notice. The funeral notice will also contain details about the funeral that is to take place. In a formal language, it requests the invitees to come and pay their respect to the deceased. Usually, the funeral notice boasts of a very sombre tone and a sophisticated design. You can also see Funeral Templates for Father. Check your facts beforehand. Making silly mistakes would be a grave mistake on your part in such circumstances. Also, do not forget to check your tone. It must be kept sombre and should adhere to the solemn ambience that a funeral brings to mind. Use formal and professional language in your funeral notice. Keep the notice as short and to the point as possible. It should be precise and compact. 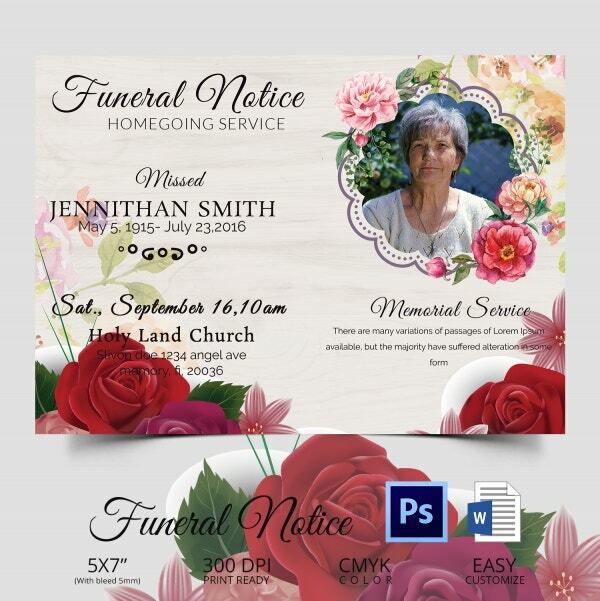 The funeral notice templates that you see here would be perfect for the occasion. The templates have been designed by the professionals who know exactly what you want and exactly the kind of tone or ambience the templates should have. All you have to do is download the right one!